Strain typing of pathogens: how to choose? 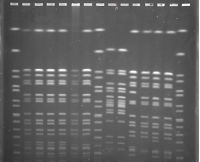 If you have dealt with bacterial disease on a poultry farm, you are probably familiar with terms like “serotyping”, “fingerprinting”, or “DNA sequencing”. The purpose of these techniques is to study strains of bacteria – for each bacteria like E. coli, there are thousands of different strains. Understanding differences between strains helps to track bacteria in a system and identify control strategies. All of the strain typing methods mentioned above are commonly used to understand the spread of a bacterial strain during a disease outbreak. However, different tests provide different information, and it is important to understand nuances between tests. Serotyping is based upon proteins on the surface of the bacteria. This has been used for many years to classify bacteria. For some bacteria like E. coli and Salmonella, this is very effective because serotype correlates with the genetics of the bacteria. However, in other bacteria such as Ornithobacterium rhinotracheale (ORT) and Pasteurella multocida, serotype does not correlate with the genetics of the bacteria and therefore can be misleading. Fingerprinting is a broad term that includes many techniques. Most of these techniques involve either “chopping up” DNA, or amplifying specific pieces of DNA, resulting in a “fingerprint” that a scientist can visually look at (right image). This technique is very effective for identifying genetically related strains of bacteria. But it is not always clear enough to find an appropriate strain that represents the problem bacteria in a flock. DNA Sequencing is another broad term that can range from DNA sequencing of small pieces of a genome to analyzing the entire genome (whole genome sequencing). Whole genome sequencing has the ultimate resolution, and can effectively distinguish between even very closely related strains of a bacteria. The main drawback of whole genome sequencing is that it can be complicated to analyze the data. Let’s use ORT as an example to compare different techniques and how they could impact a producer’s decision to design an autogenous vaccine. 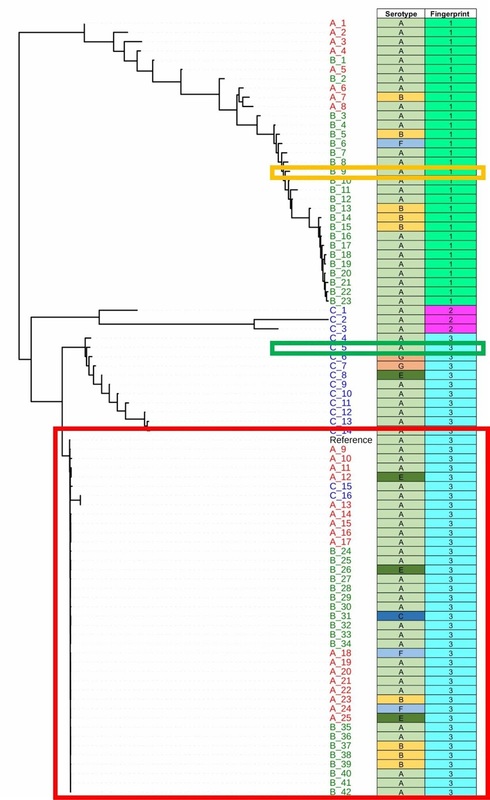 ORT is a common, and perhaps re-emerging, respiratory pathogen of turkeys. The image below represents real-life ORT data, with a phylogenetic tree generate using whole genome sequencing. The RED BOX represents a problematic strain found within a flock that needs to be targeted with vaccination. 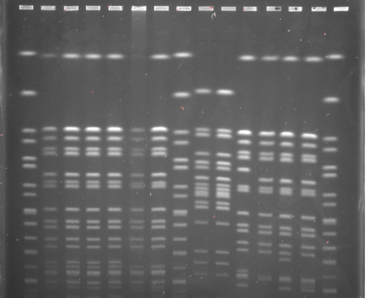 The Serotype column shows results of serotyping of the strains, and the Fingerprinting box shows results of DNA fingerprinting of the strains. Suppose a producer used serotype to identify serotype A as the most common serotype, then selects a serotype A autogenous vaccine strain (gold box). Because serotype does not correlate with genetic profile, the producer selects the strain in the gold box and completely misses the problematic strain (red box). In this case, the vaccine strain would be ineffective against the problem strain. Similarly, a producer might use DNA fingerprinting to select a strain from profile 3 to make an autogenous vaccine (green box). Because DNA fingerprinting lacks high resolution, the producer chooses the green-boxed strain and the vaccine would again be ineffective against the problem strain. However, if the choice was based on the whole genome sequencing tree on the left, it would be clear that the producer needed select a strain from the red box, and the vaccine strain would protect against the problem strain. This real-life example illustrates the power of whole genome sequencing, and why the technique being used for strain typing needs to be carefully considered when decisions are being based upon those results. In the case of ORT, whole genome sequencing is superior to serotyping or fingerprinting for strain typing and will be more accurate when making vaccination decisions. Whole genome sequencing of poultry bacterial pathogens is being performed at MCROC free of charge as a part of an MTGA-funded research initiative. Please contact Dr. Tim Johnson (tjj@umn.edu) if you want to give it a try.